What Is This Jersey Fabric? Jersey gets a lot of people confused and rightly so. Unlike silk, cotton and wool, Jersey is not a natural fibre itself! Jersey is basically a knit fabric that stretches. Why Is It Called Jersey Then? Because it was first developed on the island of Jersey off the coast of England. Originally jersey was made of wool but these days it’s mostly cotton or combination of cotton and synthetic fibres like polyester. As mentioned earlier, jersey can be very stretchy, light weight and its most common usage around the World is for making T-shirts. It is very difficult to say what is an advantage or disadvantage of a certain fabric or style because this is very subjective. It’s even more difficult for something like jersey hijabs because jersey itself is not a natural fibre but a knitting technique and could be composed of several natural and/or synthetic fibres. Also something that may be appealing to one person for a reason may be the exact reason why another person finds it uncomfortable. So we will list various defining attributes and characteristics of jersey hijabs for you to make the choice easier. Knowing these facts will help you narrow down what hijab styles and fabrics you should choose for which occasions. Jersey hijabs are super comfy & soft. So if you want a hijab that’s pleasing to touch, jersey hijabs are the way to go. Jersey hijabs don’t have any shine or sheen to them, so lot of hijabis would avoid these as party wear but they are one of the best hijabs for casual wear. With some fabrics, even with the modern textile industry that we have today in the World it is still not possible to do lot of patterns and colours. Jersey however allows for a very large number of patterns and colours, so if you like variety, jersey hijabs will not let you down. Most jersey hijabs can simply be thrown into your laundry basket and washed with your weekly laundry without any damage to these hijabs. Jersey hijabs can often shrink so keep this in mind before you buy them. Jersey hijabs because of their stretchy nature can also stretch out after prolonged usage or washing. Jersey hijabs are also usually wrinkle resistant so a perfect choice for those of you hate ironing! When Should I Choose A Jersey Hijab? Jersey hijabs are best for casual wear. 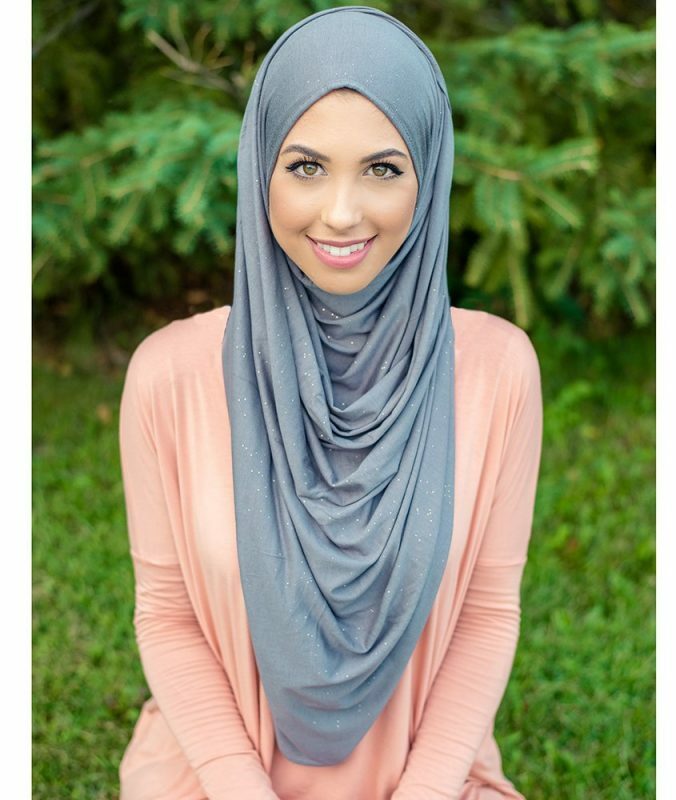 They don’t wrinkle easily so no need to iron them before you need to just quickly get a hijab on your head for either work or a casual night out with friends. Also, it is easy to throw on without having to worry about pinning your scarf into place, as it adheres to your shape. Jersey hijabs also come in different sizes, shapes and colours so you will always find one that is suitable for the occasion and matches your outfit too. One of the good or bad things depending on how you look at it, this material clings on the face. So if your face is round, unlike the Turkish hijab, jersey hijab is one you might want to avoid as it will make your face even rounder.